Steep terrain is cause for a number of challenges in New Zealand. Seeding is often done by helicopter and supplemental solar-powered panels are needed at the summits. The author is a freelance writer from Kingman, Ind., who spent a year working and touring in New Zealand. 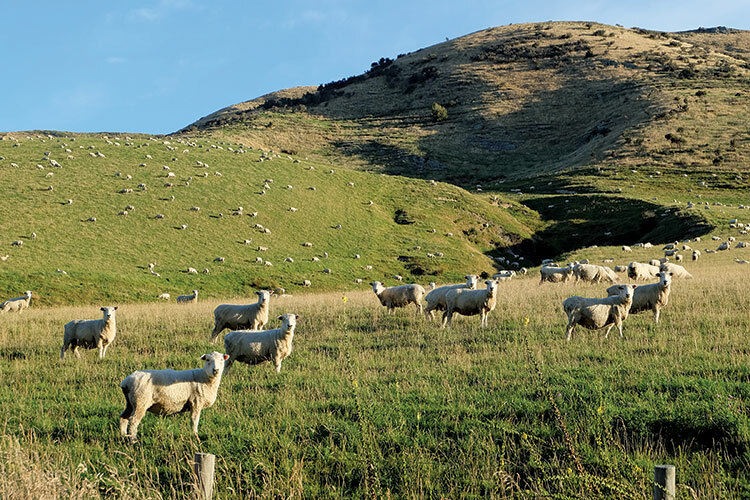 An online search for photographs of New Zealand agriculture often results in landscapes of happy sheep grazing on lush pasture against a backdrop of snow-capped mountains, all under bright blue skies. During my year in New Zealand, I marveled at many similar scenes. Paddocks of ryegrass, fodder beet, clover, and even kale filled the Canterbury Plains, with the majestic Southern Alps in the background. Alfalfa thrived in the high altitudes of Mackenzie Country with the help of irrigation. Sheep were everywhere, and surprisingly, so were dairy cattle. Beef cattle sat peacefully on steep hill slopes, dappled sunlight streaming through the surrounding trees. I was in the country on a working holiday visa, which allowed me to take seasonal jobs as I traveled. I worked on two dairy farms, a sheep and beef cattle station, and a university research farm. I also briefly joined American Forage and Grassland Council (AFGC) members on their New Zealand tour, journeying around the South Island to attend the New Zealand Grassland Association annual meeting and visit Kiwi farms. Through my work and travels, I saw innovation in forage production, variety development, grazing, irrigation, and more. Many livestock producers in New Zealand use grass-based systems with minimal buildings. An overall temperate climate means that grass can grow year-round. In mountainous and hilly regions, animals find shelter in brush or rocks. In the plains, evergreen trees are planted for shelter around farm borders. Within these borders were permanent and temporary paddocks full of various forages. Ryegrass, clover, and alfalfa were popular. Mixes were used often. Several dairy farms grazed kale in winter. Animals rotated through paddocks at varying speeds, depending on the species. On the dairy farms where I was employed, cows were moved every day after milking. At the university research farm, we moved lambs to the next paddock once per week. On the first dairy farm, staff spent three hours a day rolling down paddocks as the soil was so soft the cattle left deep hoofmarks across the entire area. Flattening the soil readied the field for the next mob of cows. When that group moved on, the paddock would be rolled down again. This soft soil also was found on my second dairy farm. There, my picture of New Zealand’s eternal lush green grass changed. I worked there during a rainy autumn and in a lot of mud. Similar to the first dairy farm, this operation comprised 1,600 cows and more than 40 paddocks surrounding the dairy shed (milking parlor). To add some variety to their diets, a mob of 400 to 500 cows grazed on a 6-foot- wide strip of fodder beet that stretched the length of the paddock for about 45 minutes before farm staff moved them to their night paddock. In theory, it sounded good, adding nutritional variety while still using a grazing system. In practice, it became a sticky situation. The cows would graze everything in sight, including thorny Scottish thistles and other weeds. They would pull up roots and trod on bare soil created from previous grazings. Combined with constant rain and mist, this process formed slick, deep, dark brown mud. I didn’t know how deep until I drove into it with a four-wheeler. I’d been moving a temporary polywire fence halfway down the paddock and needed to change direction. Rather than make a three-point turn, I ventured into the mud. I’m on a four-wheeler, I thought. It’ll be fine! I didn’t make it far before mud gripped the tires and pulled them down half a foot. I dug into the gas lever. It was no use. The wheels spun and sank even deeper. The ground below the mud was so soft there was no support for even a light machine. I shut off the four-wheeler. Boots sinking deep, I squelched my way to the safety of the fodder beet and called a co-worker for backup. He brought an ATV and connected a rope from its rear hitch to the four-wheeler. The ATV tried and failed to gain traction in the mud. Soon, it was stuck, too. My co-worker glared at the situation, then stomped to the four-wheeler and said, “The four-wheel drive’s off.” He flipped a switch and drove it to solid ground. He then fetched the tractor to pull out the ATV. I controlled its wheels as the tractor dragged it out of the mire. Thick globs of mud splattered and mottled my left side and face. I couldn’t see through the windshield. I leaned out of the side to drive the vehicle back to the dairy shed and hose it off. To add insult to injury, the cows’ udders were coated in mud the next morning. We washed the udders with a hose before attaching the milking units, struggling with a rotary parlor milking that took three hours on a good day. The farmer said he didn’t want to graze the fodder beet again the next year. Because the climate can vary greatly among regions, water is often needed for irrigation. Water for irrigation on the South Island is brought down from the Southern Alps to the lower hills and plains through water channels like the one seen on the left. Thankfully, I didn’t see much mud when I worked on a beef cattle and sheep station in the hills of Otago. There, I learned how to drive on the steepest grades I’d ever seen. Holstein yearling bulls and Dorset Down sheep grazed on ryegrass, clover, and turnip mixes, their seeds distributed by a helicopter. In more gently sloping areas, a tractor and planter were used in bare soil. Before any of these forages could be established, the farmers needed to rip out gorse, an invasive plant from England that settlers introduced to create hedgerows. Because the New Zealand climate is more temperate than England’s, gorse flowered twice instead of once. It took over, choking native plants. Before successfully farming a piece of ground, the gorse needed to be removed. The field with the thickest forage establishment sprawled at the base of the hills, enclosed by a permanent six-strand wire fence. Within it, temporary paddocks were created with white polywire and a variety of metal, plastic, or fiberglass posts. The yearling bulls grazed there, and they were moved to a new paddock every two or three days. I would lay down the polywire by zooming across the paddock in an ATV with my left hand holding the reel straight out to the side, unrolling the wire as I drove. Then, I’d set the posts. The tricky part was the electricity. It couldn’t be shut off because the bulls would flood into the new paddock as soon as the electricity disappeared. Sometimes, I needed to thread a hot wire through a post. If I twisted the post the wrong way, I received a shock. The electricity wasn’t easily transmitted up the hills, though. Mobile solar-powered panels were used for rotational grazing systems at the summits. We set the panel box on the ground and connected a jumper cable cord to the polywire. While I worked as seasonal labor and didn’t always hear the reasoning for management decisions, I read newspapers like NZ Farmer to learn more about the challenges that Kiwis faced. One such challenge was the change in water quality after a steep increase in livestock numbers and irrigation use. Journalists, farmers, and business representatives talked often about maintaining the country’s reputation as the home of grass-fed animals and a clean environment. On-farm waterways and precision irrigation were some of the potential solutions discussed for maintaining that reputation. Regulation also was frequently discussed, especially during a visit with AFGC members to a station just outside the borders of Mackenzie Country. This region is a mix of mountain lakes, valleys, and rocky peaks; it includes Aoraki Mount Cook, the nation’s highest point. Many sheep and beef cattle are run there, and tourists from across the globe visit the area. This high country station ran 4,000 sheep and 100 beef cattle. The operation was established in the early 1900s when the owner’s family emigrated from Scotland. Since then, the landscape has changed a lot. Several decades ago, a man-made lake submersed thousands of acres from the original station. The farm relocated 6 kilometers (3.7 miles) away. Government regulations now place a nutrient cap and a limit on how many animals can be managed there. The producers had to reconsider their business, finding ways to produce more meat and wool from the same number of animals and continue supporting their family. They also wanted to be able to pass the farm to the next generation. Stock performance needed to improve. To facilitate that improvement, the stock needed good-quality forage — in this case, alfalfa. The soil was rocky, but the plants thrived under a new irrigation system, and alfalfa was planted wherever a tractor could go. Those words sum up Kiwi farms and ingenuity. In this somewhat isolated nation surrounded by the Pacific Ocean, farmers produce quality meat, milk, and wool through using forage, working to maintain their international reputation, and turning iron into gold. This article appeared in the April/May 2018 issue of Hay & Forage Grower on pages 24 and 25.